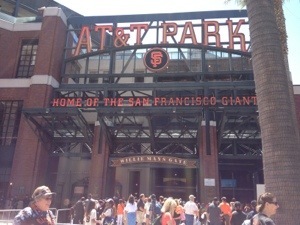 Recently, I went to a San Francisco Giants game and it was a blast! The weather was beautiful, warm and sunny but not too hot. Although I was in some seriously nosebleed seats, I was able to be shaded by the overhang. Going to a baseball game, especially for a major league team, is a great thing to include on a trip. For me, this was only a day trip since I live so close to the SF Giants’ home turf, but it can also be included in a vacation to San Francisco, or any other major league team’s home town. Be sure to get tickets before you go because most of the time these games sell out! I took the Caltrain into the city, as we got closer it got more and more packed with people going to the game. I met up with my parents, this was a family outing, and hit the Ferry Building for some vegan doughnuts at Pepples Donuts. 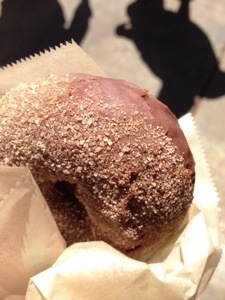 I got Mexican hot chocolate flavor and it was so delicious! My dad and I walked from there to the stadium, enjoying the view of the water. Because of the nice weather, there were many sail boats out on the bay. Upon entering the stadium we were surprised with free bobbleheads! We grabbed some food (they did have vegan and vegetarian options) and made the steep climb up to our seats. The way the stadium is constructed, the steps get steeper the higher the level you’re on, so the steps where I was were very steep. Luckily, my dad brought binoculars to combat the distance from the field. It made for a great bird’s eye view! The game itself was a nailbiter as the score was very close for most of it! It was exciting to easily feel the emotions of the packed stadium as players hit home runs or struck out. We were even able to spy the America’s Cup Italian boat (identified by its large Prada sail) practicing turns out on the bay. The America’s Cup race will be held later this summer in the San Francisco bay. The Giants won! It was an ideal game to be at. After shuffling out of the stadium, we made our way to the Caltrain station just a few blocks away. Of course, everyone else trying to do the same, so there was a line. But I made it on! Then the relaxing ride home. An excellent day trip made perfect by beautiful weather, an entertaining activity, and those whose company I enjoy. Hey there, You’ve done a fantastic job. I will definitely digg it and in my opinion recommend to my friends. I’m confident they’ll be benefited from this web site. Do you thoughts if I quote a couple of of one’s posts as long as I offer credit and sources back to your webpage? My weblog is in the extremely exact same area of curiosity as yours and my users would truly reap the benefits of a lot of the info you current here. Please let me know if this ok with you. Appreciate it! Sure, feel free to link to my articles as long as you credit the source!